Climate Skepticism Storms Into Germany’s Bundestag As Parliamentarians More Concerned About Getting Out Of Town! Browse: Home / 2018 / April / 01 / Climate Skepticism Storms Into Germany’s Bundestag As Parliamentarians More Concerned About Getting Out Of Town! Germany’s right-wing AfD party and (at times) the FDP Free Democrats, are the only parties across the German political landscape who are challenging climate change science and the country’s much maligned Energiewende. Of course the media in Germany, where man-made climate disaster is accepted as fact, tries to use this to portray skeptics as being extremist and crackpot. Yet, the FDP and AfD together make up a formidable 25% of the German Parliament, and so climate policy is no longer getting the unanimous free pass it used to get. Also a faction of Angela Merkel’s CDU party have expressed reservations about climate science and green energies. Some things are moving. Skepticism is budding in Germany, and that is in some ways remarkable in the consensus-driven country. On Friday, March 23, before the Bundestag (German Parliament), Karsten Hilse of the AfD (Alternativ für Deutschland – Alternative for Germany) party told before Parliament that there is nothing unusual happening to the global climate today, and that the changes we are currently observing are well within the natural range. Hilse then scoffs at claims the planet is heading for an apocalypse. (Please excuse the poor audio quality). Hilse expressed his party’s doubts that one extra molecule of CO2 per 10,000 has the climate impact that is often claimed to have. He reminds that the global warming is mostly generated in models – models that are unable to reproduce the past, and thus cannot be relied on to make forecasts for the future. At the 2:40 mark Hilse fields a question from an opposing Parliamentarian, who asks why Hilse rejects the consensus of “99% of independent scientists”. “Which scientific sources are you citing for your pseudo-statements?” Hlise explains (amid some background shouting) that the study in question is flawed: Of the 12,000 publications examined, some 8000 took no position at all. Background here. Near the end, Hilse went on to reject the government’s de-carbonization effort by 2050, often dubbed as the Great Transformation, and Germany’s participation in binding international decarbonization treaties. He also says the AfD is calling for a stop to the financing of pseudoscience and an immediate stop of the German EEG renewable feed-in act, which he calls a “socialist redistribution”, that so far “has cost consumers several hundreds of billions of euros”. 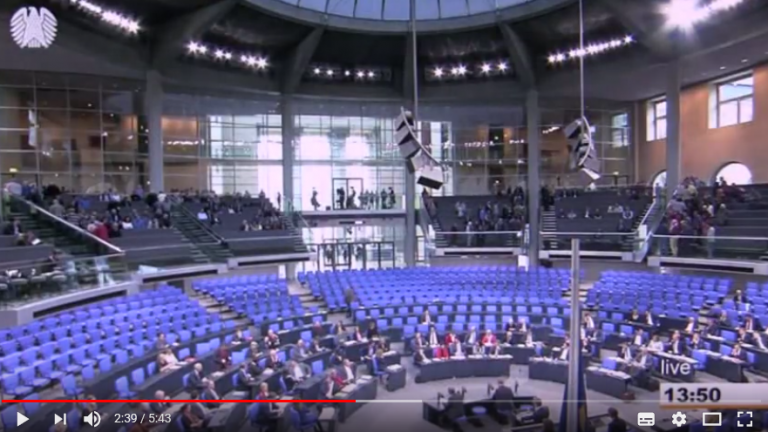 Viewers will note how the Parliament is almost empty for that particular session on CO2 emissions, which tells us just how seriously the German government takes “humanity’s greatest threat”. Obviously few of them cared enough to show up, and most were more concerned about getting out of town really early for the weekend. It is both encouraging and heartwarming to see that the speech get applauded numerous times. Maybe the truth is getting further than some cAGW advocates would wish to believe. Poor audio – Don’t fret too much Pierre those of us who can’t speak or understand German just read your translation thank you. It hurt to hear this clown speak … he wants to halt ideological pseudosciences? Then he should stop presenting the “skeptical” nonsense like it is the absolute truth. Begins the speech with greetings to “patriots from Dresden” (really “concerned citizen” who are afraid of people different than them despite living in the state with the least foreigners) and ends with the usual climate denier delusion of “knowing” that “real science” is on their side … really a clown, and of course his fellow clown party friends do applaud. Why would they not? Blogs like this one also have their uncritical followers who praise everything that’s being said without being the least bit skeptical. Quite a substantive rebuttal, SebastianH. Name-calling, insults, and the puzzling “climate denier” reference. I’m curious as to how someone can deny the climate, but we’ve been through this before. You DENY that we are currently at a very much cooler period of the current interglacial, only just above the COLDEST period in 10,000 years. You DENY that the MWP and basically all the 9000 year before it were significantly warmer than now, and that is when human civilisation developed. you DENY that Arctic sea ice is only just a tiny amount down from the most extreme period in 10,000 years, and still in the top 10% of the current interglacial. You DENY that the ONLY warming in the satellite record has come from ocean effects, especially El Ninos and therefore has nothing to do with human anything. You DENY that gravity forms the thermal gradient that controls atmospheric temperature. You DENY that enhanced atmospheric CO2 is TOTALLY BENEFICAL to all life on Earth. These denials point to the real CLIMATE DENIERS. AndyG55 it’s just the same tired old nonsense from the out of work burger flipper. I bet he needed someone there to tell him when to flip, or phlop. Also a gratuitous dig at the supposed zenophobes of Dresden. A classic example of denial of the realiy on the ground in Germany. You really are stuck on EMPTY, aren’t you seb. You are talking about NATURALLY occurring events, that have occurred regularly throughout history. To even fantasise that they are caused by human anything is child-minded naivety and DENIAL of NATURAL history. Why would I and what does that have to do with the reality of AGW? It probably wasn’t, but again, what does that have to do with the reality of AGW? For what it matters it could have been 20°C warmer 1000 years ago, the climate is still warming caused by a large part by our emissions. Definitely yes! What a bunch of nonsense. El Ninos Events in itself are just a redistribution of heat content. The heat content increases because of the CO2 forcing. Of course I do … what sane person wouldn’t? You are contradicting physics with your gravito-thermal-whatever nonsense. Probably the highest honor, to be named as one of them. Thanks AndyG55. Not one single scientific rebuttal of any point I made. Just mindless DENIAL and mantra driven regurgitation of your brain-hosed WILFUL IGNORANCE. Unprovable brain-washed BS. Where is the proof? You have NONE, just yap the mantra. Then why the absolute and total INABILITY to produce one single bit of empirical proof? So you really do DENY that gravity forms the gravity thermal gradient. BIZARRE !! Your grasp of basic science and physics is below that of a child. DENIAL of basic physics.. really !!! You have to DENY the basics of science, physics, biology and REALITY itself, for your silly little anti-CO2 fantasies to not collapse in a massive heap of wasted sludge. You have NOTHING.. you are EMPTY. Please elaborate where you made a point that is in need of being rebuttaled? There is no downside to increased atmospheric CO2, the world developed when aCO2 was MUCH higher. For life itself that’s probably true at the low levels we are talking about. But it so happens that the imbalance causes stuff to happen. In one direction parts of the planets freeze and get covered with ice in the other direction coastal region get flooded. Also the way we get our energy is unsustainable, why would we not want to change to a better form of using the Sun’s energy? Still NOTHING but EMPTY nonsense. !! Basically every yap of yours is WRONG. Surface temperatures are NOT higher than expected, they are pretty much exactly as expected by the solar input, ocean storage and atmospheric pressure. Basic physics, which you have proven you have basically zero comprehension of. What load of FANTASY, make-it-up, anti-science BS..
…you really need to get back to rational thought and discover some basic REALITY.. ! There is no better, more RELIABLE, form of the sun’s energy currently available than coal..
.. that is why the world continues to expands it use. There is absolutely ZERO science that proves CO2 can warm oceans, its scientific NONSENSE. Tempting as it is DNFTT. Continuing the theme that every insane minutia of the deniosphere that doesn’t get proper “counterarguments” and a “substantive rebuttal” must then automatically be the truth. It’s fantasy and simple minds like those AfD clowns are exploiting it and falling for it at the same time. Obviously you missed the point. Responding with name-calling and insults is viewed as a testament to one’s desperation. It does not lead others to believe you have anything of substance to say. Just the opposite. In other words, these kind of responses don’t work if you’re trying to persuade people, and it would probably be better if you had decided not to respond at all. Responding with name-calling and insults is viewed as a testament to one’s desperation. It does not lead others to believe you have anything of substance to say. Tell that your buddy AndyG55 or tomOmason or the many others commenting here. You can’t be persuaded, I have given up on that fight long ago. You sounded rational to me in the beginning, but you are not. It’s cherry picking blog science what you guys do and simple minds fall for it. You could never produce any actual scientific evidence for ANYTHING, least of all the fallacy of atmospheric CO2 warming. EMPTY, zero-substance rhetoric is never going to persuade anyone. You have NEVER sounded rational, just ranting a fanatical brain-hosed AGW mantra. Thinking, and rationality are not part of your simple-minded brain-hosed naivety. When have you ever offered anything in the way of a scientific counter-arguments, or rebuttals based on anything but mindless mantra ?????. It is good to see you finally ADMITTING that you have NOTHING in the way of actual science to offer, just EMPTY belief. I’m curious as to how someone can deny the climate, but we’ve been through this before. Yes, we have been. It’s funny how you try to distract. Same as with the “nobody even mentioned conspiracy here”. I am pretty sure you know what is meant by the term “climate denier”. I am also pretty sure you know that a butterfly isn’t really a flying butter, right? It’s funny how you try to distract. You have been told repeatedly not to use the term “denier” here. And yet you do so anyway. If you’d prefer not to have these sort of “distracting” responses to your highly substantive posts, perhaps you should deign to honor our requests and refrain from using that denigrating term that actually makes no sense when paired with “climate” as has been pointed out multiple times. But will you stop? Of course not. You’ll keep on calling people who don’t agree with you insane, clowns, deniers, nutters, retirees, conspiracy theorists who live in fantasy land…or you’ll make note of their skin color. Why not elevate the level of discourse, SebastianH? Why do you come onto other people’s turf and continue to call us the same names despite being asked to stop again and again? Why not be more courteous? Welcome back Seb. I hope you had a pleasant weekend. So now at 8.36 a.m. in the morning you’ve booted up the computer, gotten a fresh cup of coffee and you’re back at work, posting all day here while on the job? You must have an easy employer allowing you to comment all day long during worktime. I noticed you posted nothing the whole holiday weekend. Suddenly now that the work week starts, you’re back to posting. I’d be very curious to know who your employer is. Hopefully you are not a public employee paid by the taxpayer. I could never imagine a worker for a private free-market company getting away with such abuse. Frankly I should probably ban your comments during regular work hours. It would be very dishonest to comment on someone else’s time. I noticed you started doing just that … well then. I have the final say on what appears here. If I feel the comments are not up to par, then I delete them. You’re welcome to make comments here, but don’t expect me to let use use this site as your platform to vent and insist you’re the bearer of the Truth. You’re free to start your own blog. Thanks for the advice, please apply your high standard to others commenting here as well … it’s hard to be on the other end (for everyone not sharing the deniosphere views) of the constant insults here. Surely those comments aren’t “up to par”, right? Oh, I do delete other comments as well. True I may be too lenient with some. Although you’ll ignore this request, I would ask that you refrain from utilizing any variation of the word “denier” here. It’s rude and denigrating. It would be a veritable pit of mindless anti-science rhetoric. YOU CAN’T HANDLE THE TRUTH. !! Let’s see that “science” that proves that enhanced atmospheric CO2 does ANYTHING except enhance plant growth. Poor chatbots! How they suffer – lol. Yeah yeah, the truth … your truth, your fantasy. Why do you get triggered all the time by anything someone not supporting your fantasy writes? Why all the caps locking? Yet another ZERO-CONTENT, empty-of-fact post from poor little triggered SJW seb. It must be very painful for you to KNOW that you cannot provide a scientific counter to anything that was said. You KNOW that every word of Pierre’s translation was the actual TRUTH. Big TICK. Cook’s work has always been a load of farcical garbage. You CANNOT handle the truth. Your whole petty fanatical AGW religion is a LIE. !! “99% of independent scientists”? The Cook pseudo-survey found that ’97 percent or more of actively publishing climate scientists agree climate-warming trends over the past century are extremely likely due to human activities’ which is practically the same as what the IPCC first report in 1990 claimed; almost thirty years of painstaking research by an army of climate scientists costing trillions of dollars and no progress — an indicator of pseudoscience. Apart from being an appeal to authority it’s a trivial self-evident statement, a truism. Paraphrasing Mandy Rice-Davies (British model and showgirl best known for her association with Christine Keeler and her role in the Profumo affair) ‘they would say that wouldn’t they’. The credulous treat it as a scientific axiom comparable with Newton’s Laws — it’s absurd. No I’m wrong, if they were asked what the alleged ninety-nine percent supposedly agree about, they couldn’t tell you. Exposing the Cooked AGW books. “It is clear that. from the very start, Cook and his colleagues were intent upon providing an eye-catching “consensus” which they could sell to the media, and which would be picked up by politicians and others in the establishment, regardless of what the evidence actually said. 99% won’t do at all. It is not scary enough. Next year, 110%. It used to be that “42” was the answer to everything. Now it is “97” or 99 or some such. Or maybe 350ppm, or 2°. I like 99 44/100 — you can look it up. All of these are made-up numbers. Those of the cAGW fellowship are like atoms — they make up everything. The other big made-up number is 2°, which Schellnhuber admitted to be meaningless but which he plucked out of thin air to keep the pollies happy. The original 97% came from Doran and Zimmerman which started off with 10,000 questionnaires, 3,000 replies, and ended up with 78 in the final analysis. Zimmerman herself eventually distanced herself from the paper. And these 78 were often referred to as “97 % of the world’s climate scientists”, whereas they only came from North America. It was so bloody hot yesterday that my one leftover easter egg melted. According to the weather report on TV (arbiters of truth) it was the hottest easter ever.. Thats right EVER! China is currently in the lead, having overtaken Japan in 2000 as Asia’s leading exporter of coal industry equipment. It remains the largest technology supplier to India and the second-largest investor in coal projects in Vietnam, behind Japan. It is also constructing Bangladesh’s first clean coal plant. These developments reflect Beijing’s advantage in providing the necessary coal funding. …Japan at a time when most multinational banks have restricted coal funding. … Tokyo has ramped up coal use and has raced ahead in clean coal technology development. Japan now boasts the world’s most efficient coal-fired plant, which uses less coal to produce more electricity. Seizing on this competitive advantage, Japanese Prime Minister Shinzo Abe has tried to capitalise on these capabilities in a bid to increase Japan’s reach across Southeast Asia – and in China’s backyard. Yep, coal use may dwindle in the West but the East is gunge-ho for more high efficiency coal fired development for themselves and those around them.